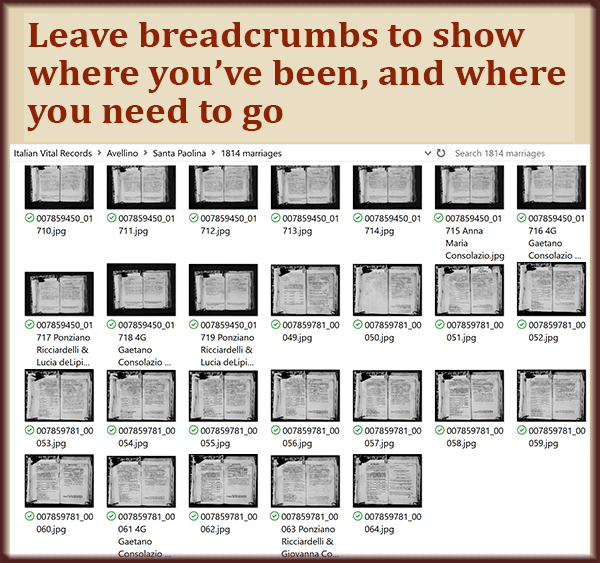 You may have heard that come September 1, 2017, you can no longer order microfilmed records from FamilySearch.org. 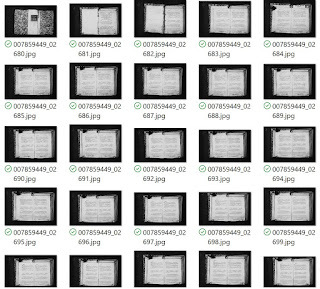 I didn't think I'd need microfilm anymore since records are being digitized. 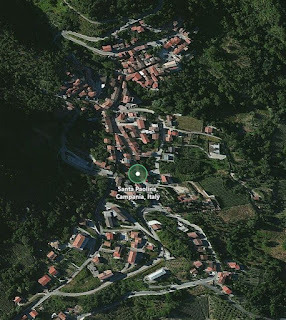 But I have one small town in Italy that needs my attention now. So I ordered the microfilm and went to view it at my nearest Family History Center today. 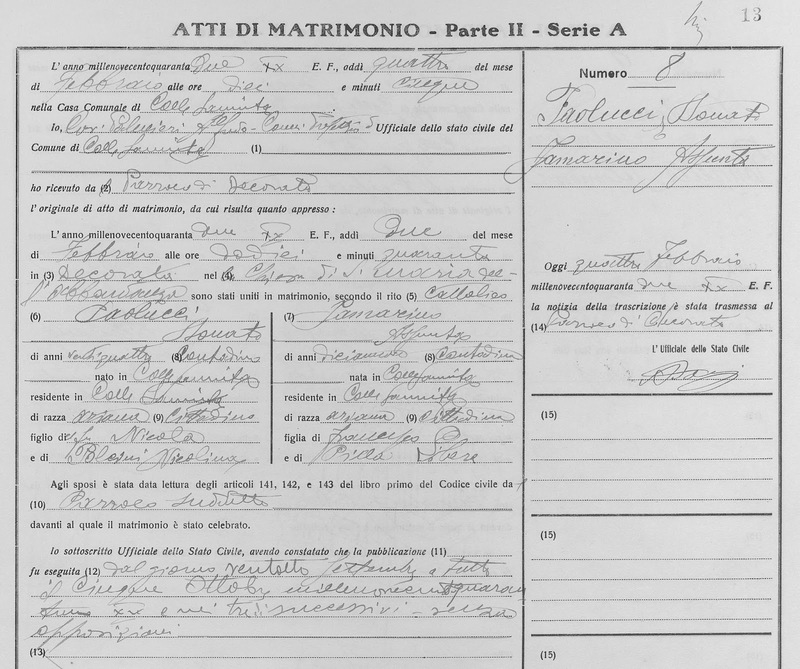 I was focusing on my great grandmother's parents, Antonio Saviano and Colomba Consolazio. I'd hoped to find their births, their marriage, and their parents' names. I had their parents' names only from their own death records. That's not very reliable. This film does contain birth records for two of my great grandmother's brothers. But it does not have her parents' births or marriage. Grasping for something of value, I scoured each year's index for Saviano or Consolazio. I found two men who may be the brothers of my Colomba Consolazio. I found them on their children's birth records. Then I got lucky. 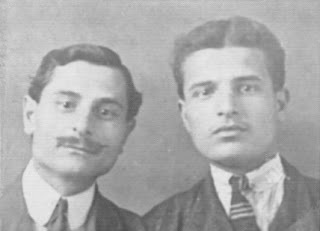 One of these potential brothers was Gaetano Consolazio. I found his marriage record and learned his parents' names. And this proved to me that he was my great great uncle. 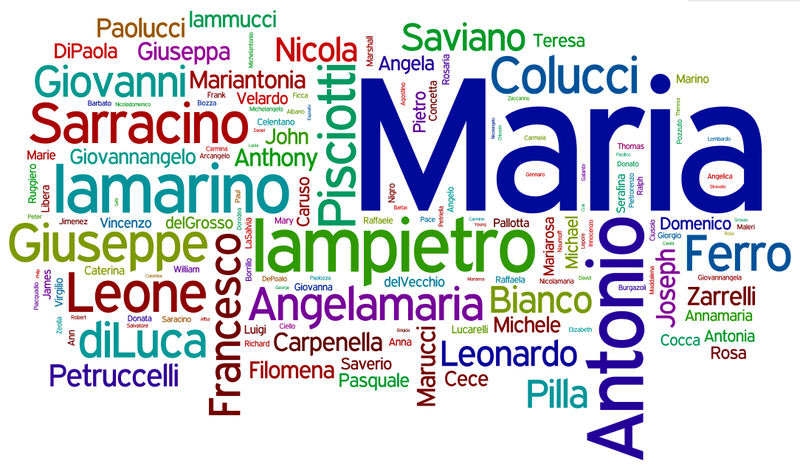 A reliable source for my third great grandparents' names. 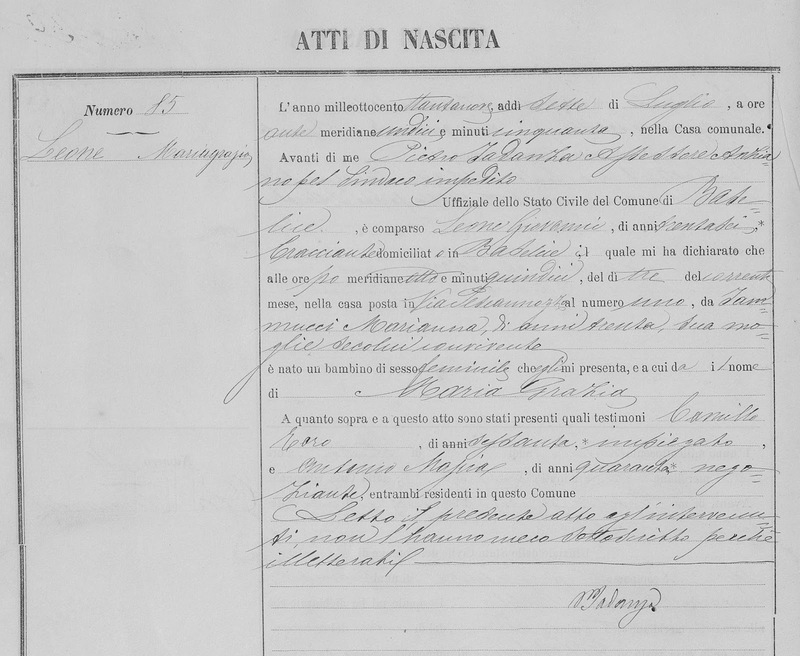 When my great great grandparents died, their eldest son, Semplicio Saviano, provided the information. He had never met his grandparents. Maybe he didn't know their exact names. The names I had from Colomba's death record were Semplicio Consolazio and Rafina Zinzaro. The name Semplicio seemed legit because her eldest son was Semplicio. Except I knew she had a baby before him named Raffaele! Rafina Zinzaro bothered me because Rafina is not a name I've seen before. 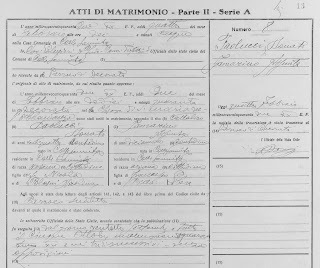 The far more reliable source is Gaetano Consolazio's marriage record. His parents, my third great grandparents, were Fiorinto Consolazio and Rufina Zullo who lived in neighboring Santa Paolina. 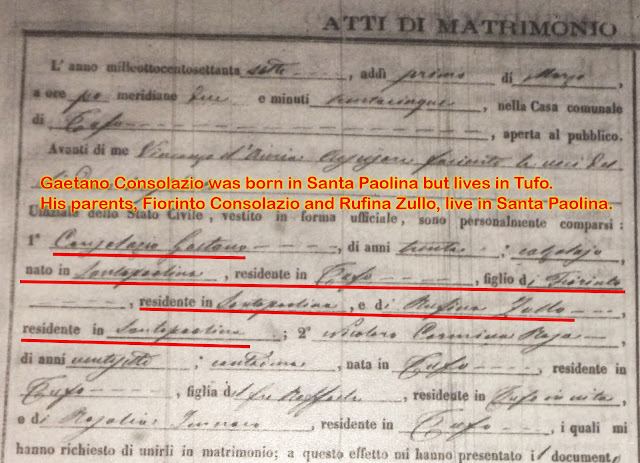 Gaetano even named his daughter Rufina, so I got to see that unusual name twice. And Fiorinto makes perfect sense to me. You see, I have records from another town showing the birth of my great grandmother and three of her siblings. 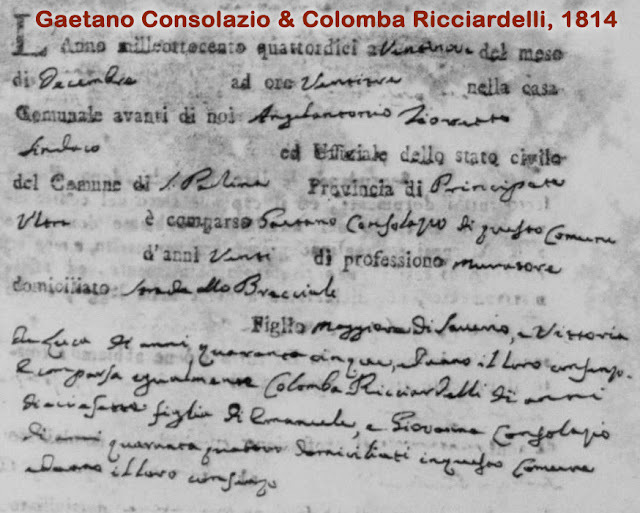 On two of those documents it says Colomba Consolazio is the daughter of Fiorinto. I thought those were the mistake. But the less reliable death record contains the mistakes. So I will score today as a victory. I'm disappointed not to have found what I wanted. But now I have reason to believe the Consolazio and/or Saviano families lived in Santa Paolina before going to Tufo. The Saviano family then moved to Pastene, where my great grandmother was born. I have no reason to think they moved because they were given land or something. The fact that they moved twice is even more bizarre. So I gained some solid information today, along with some leads. 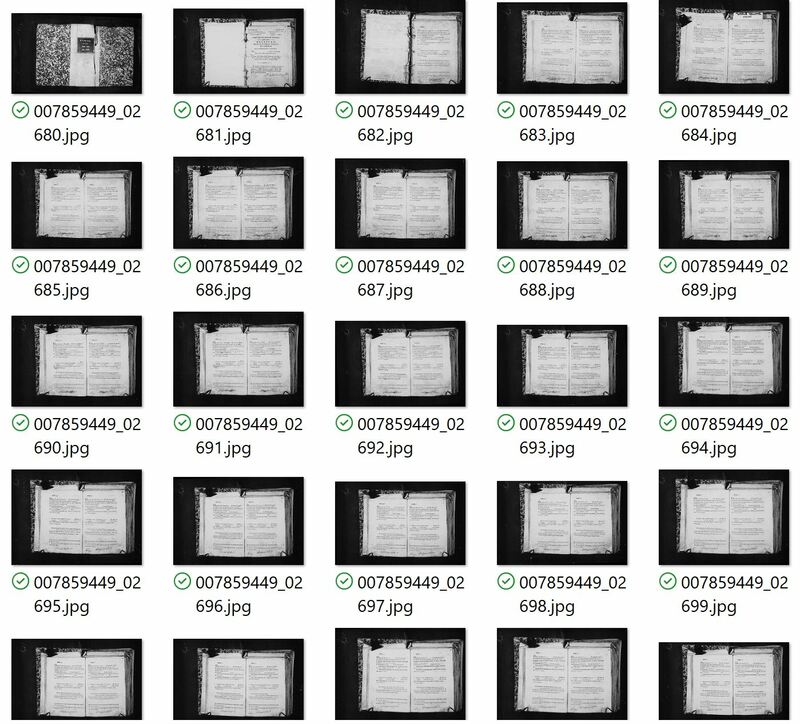 I have to quickly decide if I need to order microfilm for the town of Santa Paolina. It wasn't long ago that I discovered the maiden name of one of my great great grandmothers. (See This Expanded Resource Provided an Elusive Maiden Name.) It was a big deal when I learned her name was Maria Luigia. But it was amazing to learn her last name: Girardi. My great great grandmother's birth record. Last night, while the Yankees were winning their game, I was at my computer. 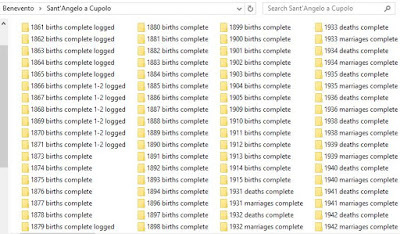 I was going through birth records from the online Italian archives. (See How to Use the Online Italian Genealogy Archives.) 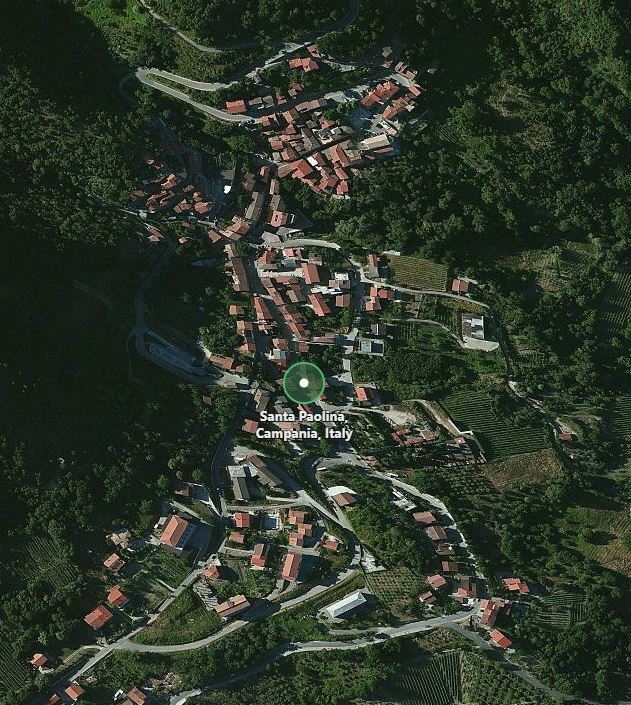 I was focusing on Maria Luigia Girardi's hometown of Pescolamazza—now called Pesco Sannita, Italy. 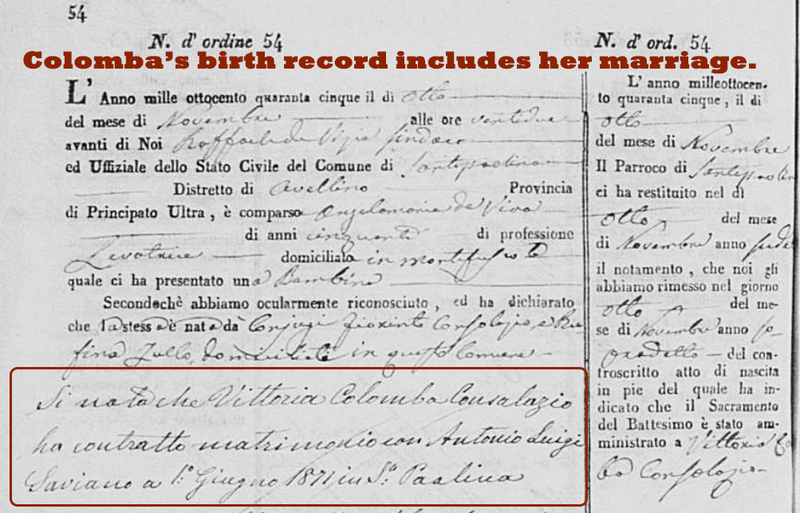 Her 1840 birth record gave me the names and ages of her parents: Gioacchino Girardi and Maria Teresa deNigris. 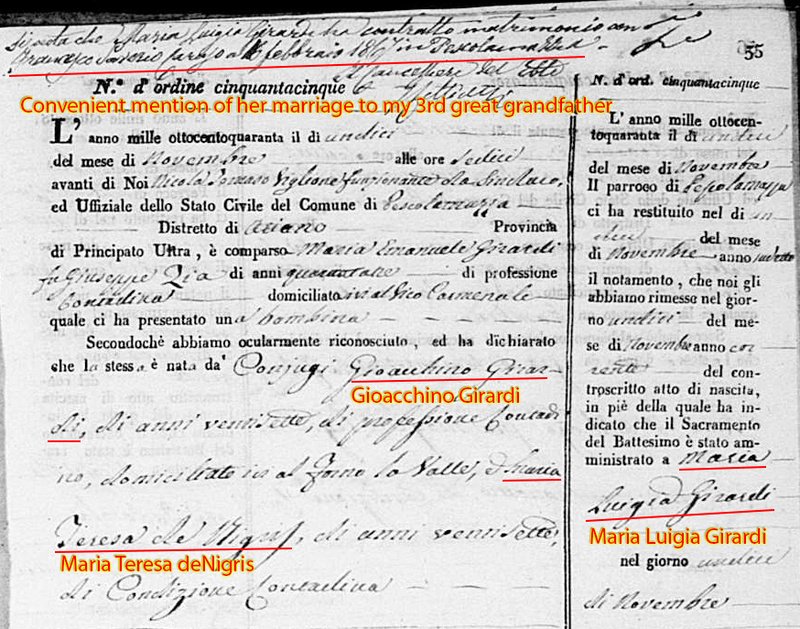 I set Maria Teresa deNigris aside for the moment and worked to fill out this family more thoroughly. 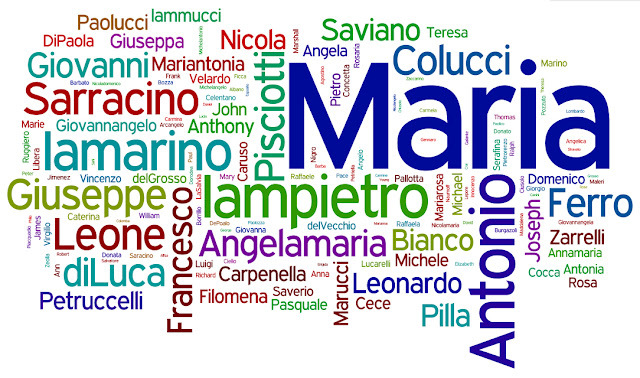 First I looked for more siblings for Maria Luigia. 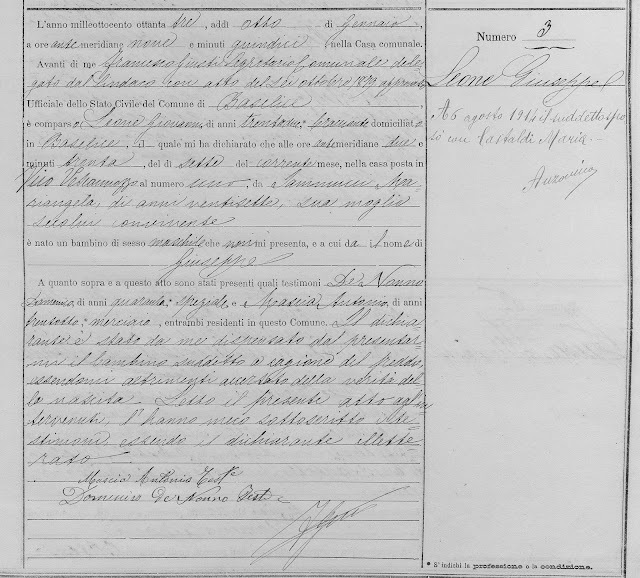 I found Emidio born in 1843, Nicola Maria born in 1847, and Francesco Saverio born in 1851. Based on their parents' ages, there should be more children, both older and younger than Maria Luigia. 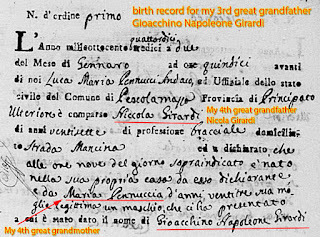 But before finishing that search, I got excited to find her father Gioacchino's birth record. My great great great grandfather's birth record. There he was, my 3rd great grandfather, born in 1814. 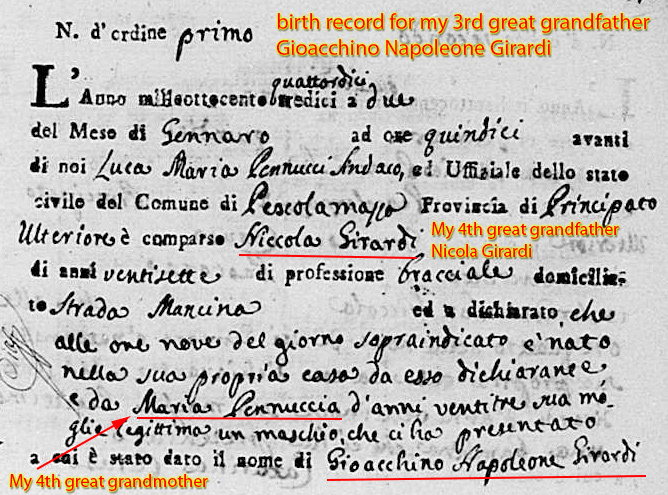 His parents, my 4th great grandparents, were Nicola Girardi and Maria Pennuccio. He was their first-born child, but I found several younger siblings by going year-by-year through the birth records for their town. Sibling Giuseppe was born in 1815, Francesco Saverio was born in 1817, but apparently he died because another Francesco Saverio was born in 1822. Maria Rosa was born in 1825 and Pietrantonio in 1829. 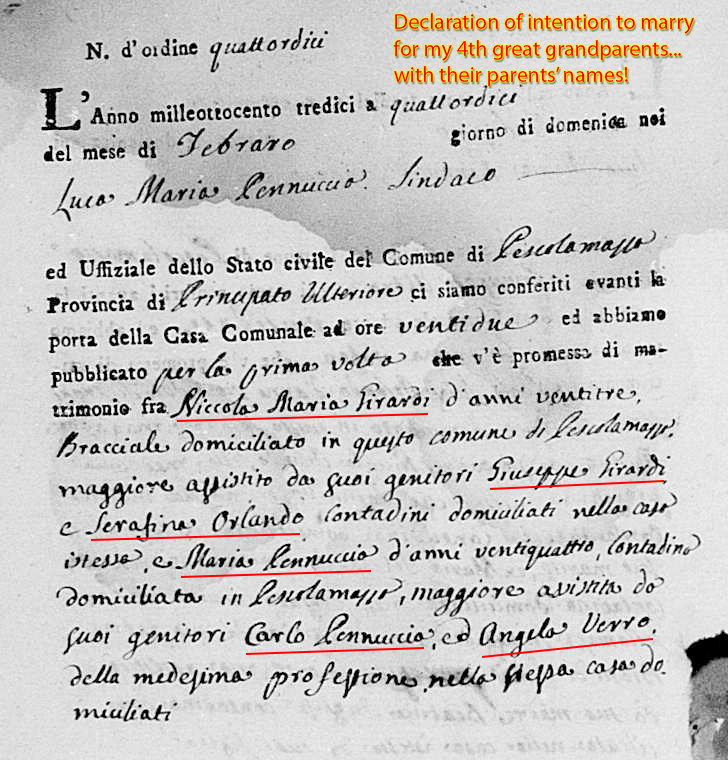 Once I was confident I'd found their first-born child, I went in search of the marriage of my 4th great grandparents. 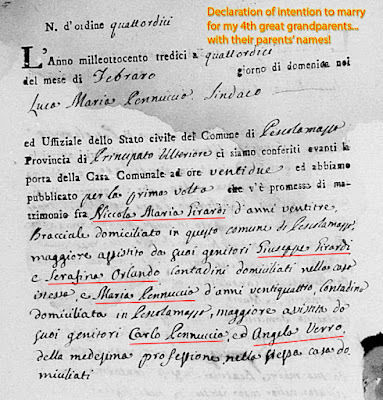 The documents for marriages in 1813 in Pescolamazza are incomplete, consisting only of each couple's two declarations of their intention to marry. Bingo! 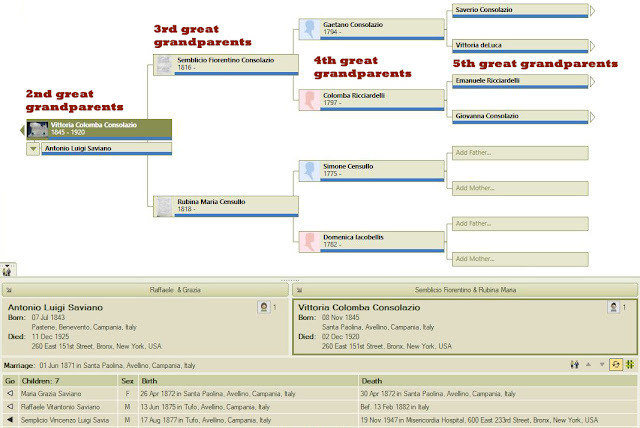 My fifth great grandparents—two sets! 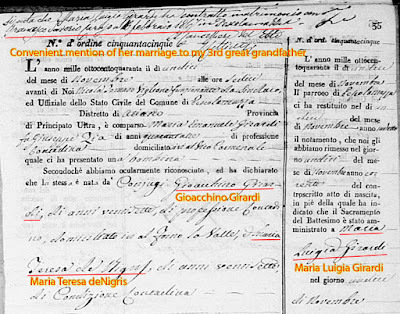 I found Nicola Girardi and Maria Pennuccio's declarations in February 1813. 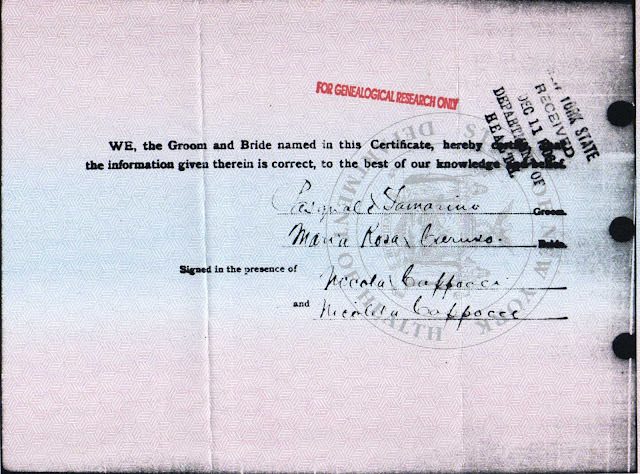 Each of these two documents contained the man and woman's parents' names. There they were. 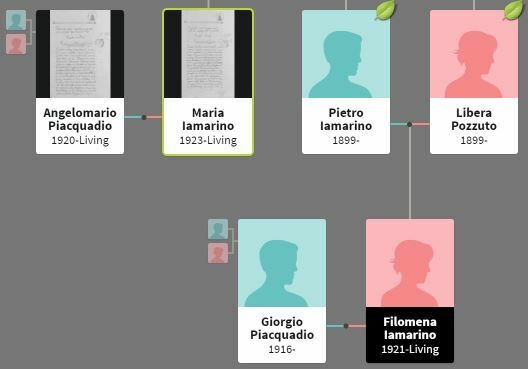 Two sets of my 5th great grandparents from a branch I would never have discovered if I hadn't learned that previously unknown name of Girardi: Giuseppe Girardi and Serafina Orlando, and Carlo Pennuccio and Angela Verro. During tonight's Yankees game, because I can't just sit on the couch all evening, I will search for more children born to these two couples. Their children will be my 4th great uncles and aunts. Having their names, and finding their children, will allow me to piece together a lot of the Girardi and Pennuccio documents from the town. Finding the siblings is the only way to know how or if other people in this tiny town are related to me. My experience in documenting the entire town of my grandfather taught me a lesson. (See Why I Recorded More Than 30,000 Documents.) 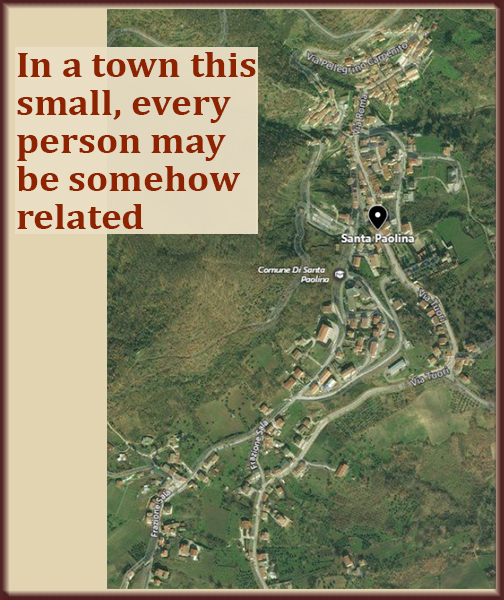 If people have the same last name, and it's a very small town, and it's an era when relocating was not common, they're most probably related. So go after those siblings. 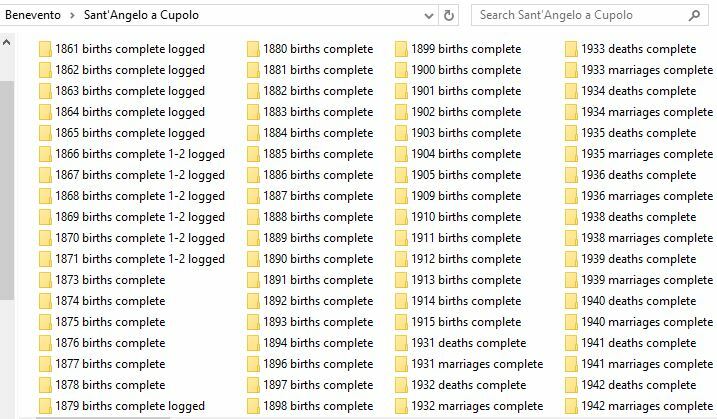 If you're searching records from the 1800s, remember that a woman might give birth nearly every year, and into her forties. While many of the children will not live to adulthood, I personally treasure each one. And I'm so thankful to find them.